There was a time when a battery charger was almost an afterthoughta gray box with an analog meter that hummed away on the bulkhead, its primary mission keeping the batteries charged while the boat was unattended. Today, that has changed. 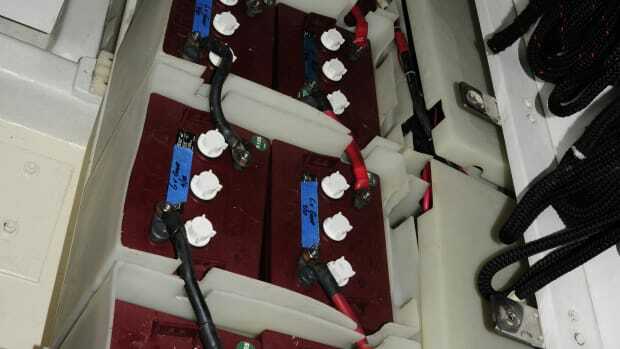 Few battery chargers hum, and many are called upon to recharge or maintain large battery banks while the vessel is in use. Frequently, I encounter battery chargers that are woefully undersized for the task they are being called upon to accomplish, or that havent been properly installed or set up for the application. The output capacity of the battery charger you select should be based largely on how it will be used. (Hereafter, when I use the word charger, Im referring to both dedicated chargers and inverter/chargers.) If, as mentioned above, the charger is simply used to maintain a battery bank while you are away from the vessel, keeping up with the occasional bilge pump cycle and perhaps the DC refrigerator, then its capacity need not be very great. If, on the other hand, you intend to use it as a primary charge source for a large battery bank while you are at anchor, or even under way, then the output needs to be greater. Most boatbuilders assumewrongly, in many cases, I would arguethat the charger will be used in the former scenario: to maintain a bank thats not being cycled heavily. Or, when replacing a defunct battery charger, a boatyard or contractor may simply assume that the old charger did the job just fine, so theres no reason to change the specifications. However, in both cases, an analysis should be performed to determine how the charger will be used and, if it will be used for more than maintenance charging, how large a bank it will be called upon to charge and how quickly. In the case of large house banks that are only being maintained, as opposed to cycled, the output of the charger can be as little as 5 percent of the battery banks amp-hour capacity. In the case of a 500Ah bank, thats just 25 amps. Remember, though, that if this diminutive charger ever is pressed into deep-cycle service, as hard as it tries, it wont be able to make the grade, and the batteries will make the inexorable slide into discharge Hades. For true deep-cycle performance, other criteria must be taken into accountprimarily, the battery type. As a rule, conventional flooded batteries are not capable of accepting more than about 25 percent of their amp-hour capacity in charger input. Thus, selecting a 130-amp charger to charge a 300Ah battery bank would be overkill. AGM batteries, on the other hand, are capable of accepting as much as 100 percent of their amp-hour capacity (and in some cases more), so its difficult to connect them to a charger thats too large. Thus, if you do seek true deep-cycle rapid recharge capability, look for a battery charger with an output of no less than 25 percent of the banks amp-hour capacity, and possibly substantially more if the bank utilizes AGM chemistry. Remember: the trade-off in the relationship between charger output and battery bank size is time. The bigger the difference between the chargers output and the banks capacity, the longer it will take to recharge the bank. If you are relying on your generator for recharging, it means that much more time the genset is running, consuming fuel, and experiencing wear and tear and the resultant maintenance. But wait, it gets worseif the genset is being operated to supply power to the charger alone, its likely seriously underloaded, a condition that is very much less than ideal for any diesel engine and terribly fuel inefficient. In some cases, you may notice that your charger output is lower when operating from your genset, compared to the output when operating from shorepower. This is a function of a phenomenon thats referred to as power factor, and it is neither unusual nor a sign of a defect per se. Its a function of the design and construction of the generators windings and the manner in which the charger reacts with them. Thus, if you intend to rely on your generator to operate a large battery charger, its worth contacting the generator and charger manufacturers to determine if there is any possibility that the charge output will be limited in any way and to see whether they offer recommendations regarding this arrangement. In the case of PMMs test vessel, while the original equipment chargers were adequately sized (there were two; one for each battery bank), after we upgraded the banks from conventional flooded batteries to AGMs last winter, we were forced to upgrade the charger, as well. In spite of the fact that the original chargers were of very high quality, because of their 1997 vintage, they lacked an AGM charge profile setting, necessitating the change. Although its rare today to find a charger that is not capable of being set for any of the popular battery types, its critically important to not only confirm this but also to ensure that the proper setting has been selected. If youve never checked your charger to confirm that it is indeed set for the type of battery your boat is equipped with, then you should do so. Charging a battery using an incorrect profile can lead to chronic overcharging or undercharging, as well as diminished battery life and battery overheating. Because the charger on our test boat is used primarily for dockside maintenance charging and only occasionally at anchor, we opted for a modestly sized Mastervolt 12/40-3 charger. This keeps all of the vessels AGM bankshouse, starting, and generatorcharged via its three independently isolated outputs. Select your battery charger wisely, and it will reliably and efficiently supply the power you need while cruising. Steve owns and operates Steve DAntonio Marine Consulting (www.stevedmarine.com), providing consulting services to boat buyers, owners, and the marine industry.